Fuller’s, London’s original family brewer, is excited to announce that it will be hosting the inaugural London Brewers’ Alliance Craft Beer Festival on Saturday 23 June 2018 at its Griffin Brewery in Chiswick, West London. That’s right a craft beer festival, not in east London. 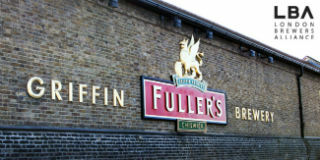 John Keeling, Fuller’s Global Ambassador and Chairman of the LBA, said: “Finally – a beer festival at Fuller’s. This is something I have wanted to see since my first day at the brewery – thirty - something years ago. A bit like a good beer – these things should be done right and cannot be rushed. I am delighted that the LBA wanted to work with us on this and I am looking forward to welcoming nearly all the London brewers to Fuller’s Brewery and tasting their beers. Finally – a beer festival at Fuller’s. The London Brewers’ Alliance was formed in 2010 as a loose collective of breweries within the M25 to celebrate the resurgence of brewing in London. Membership is restricted to established commercial brewers within the M25 (plus founder members as previously agreed). Associate Membership shall be available to anyone brewing or intending to brew commercially within the M25 converting to Full Membership after 6 months of commercial brewing. Fuller's brews a range of beer, including craft beer and cask ale. Our London Pride ale is recognised as being one of the greatest cask ales in England. Read this London Pride Review by beer reviewer 52 brews for an unbiased review of England's favourite cask ale.